The Cabulco volcano in Chile has erupted briefly for the first time in more than 40 years, leading to the evacuation of more than two-thousand residents. Local reports say people are rushing to fill up gas tanks and buy food. Calbuco is a stratovolcano in southern Chile, located southeast of Llanquihue Lake and northwest of Chapo Lake, in the Los Lagos Region. The volcano and the surrounding area are protected within Llanquihue National Reserve. It is known that UFOs have been reported near volcanoes in recent years, especially near active volcanoes. its just a photo? looks like distant birds. First of all, you can't determine directionality from one frame of imagery, so I don't know why you're so sure it's flying in and not out. 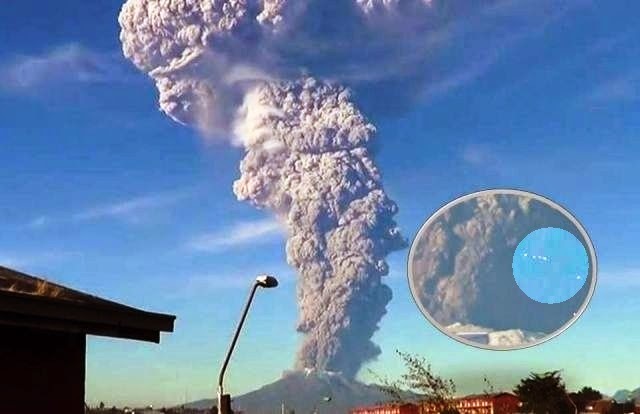 Second, do you think it's maybe more likely that the "lightning fast" thing you saw was in fact lightning, as is found to happen in a volcanic eruption, that appears to be multiple objects because it's partially obscured by the smoke?